Oasis produces a range of water coolers for use in the home and office. Features of Oasis water coolers include drip trays, large refrigeration units, extra capacity storage tanks, and hot and cold water availability. If your Oasis water cooler does not operate properly, you can troubleshoot the machine before calling for service. 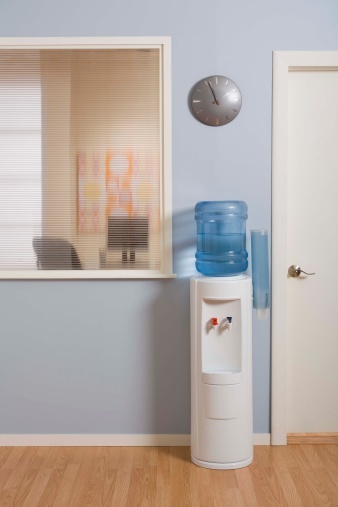 Make sure the Oasis water cooler is plugged into a working wall outlet if the water dispensed is not cold or hot. Reset the circuit breaker and replace any fuses as needed. Check for leaks around the Oasis water cooler if you have no cold water or you hear the compressor continuously running. If you find any leaks, it could mean there is a problem with the refrigeration unit. Clean the heating tank of the Oasis water cooler if the water starts to taste funny. There could be a mineral buildup causing the problem. To clean the tank, unplug the unit and drain the water until it is no longer hot. Also, drain the rest of the water from the cold valve. Close the drain valve, then use a funnel to run 1 liter of hot water mixed with 125 grams of citric acid crystals through the tank. Discard the solution and run 5 liters of bottled water through the tank before using again. Use a nonwire stiff brush to clean off any lint that may have built up on the back of the unit. Lint buildup can affect the taste of your water. Tighten all screws on the Oasis water cooler. If you hear a vibrating noise during operation, then one of the screws may be loose.